A particularly mild shampoo according to authentic recipes. Made with original Ayurvedic herbs and flowers, including bela fruit, Indian gooseberry (amla), and rose mallow. Wheat proteins improve the manageability and smoothness of even brittle hair. Ideal in combination with Vata Hair Oil. With 100% pure natural aroma oils of lavender and lemon. Ayurveda is considered as the oldest and most comprehensive health system in the world. According to Ayurveda three basic natural forces called doshas (Vata, Pitta and Kapha) work throughout nature and - in their unique combinations - structure our individual constitution. 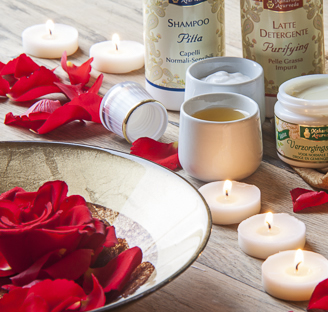 Natural cosmetics serve to beautify and care for the human body by means of ingredients from nature. This is made possible with natural raw materials, friendly to both the skin and the environment. Natural cosmetics should stimulate and support our natural skin functions, rather than supplanting physiological processes. These products offer gentle, wholesome care and are thus an important aid to the health of the skin at any age. Natural cosmetics revitalize and harmonize body, soul and spirit. The makers of the products marked with the BDIH "Certified Natural Cosmetics" seal use natural raw material such as plant oils, fats and waxes, herbal extracts and essential oils and aromatic materials from controlled biological cultivation or controlled biological wild collection. In addition to the careful selection of raw materials, the ecological impact of each product plays an important role. A particularly mild shampoo according to authentic recipes. Made with original Ayurvedic herbs and flowers, including bela fruit, Indian gooseberry (amla), and rose mallow. Wheat proteins improve the manageability and smoothness of even brittle hair. Ideal in combination with Vata Hair Oil. With 100% pure natural aroma oils of lavender and lemon. 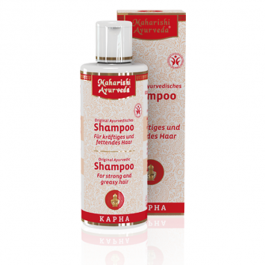 These shampoos are highly concentrated with a good yield. They are unique because of their high concentration of herbal extracts (BDIH Certified Natural Shampoo). Wet hair. Apply shampoo. Rinse off. Contains Geraniol, Limonene, Linalool (from essential oils).